Yes folks… you read that right… over 11 BILLION shares sold since 1/1/2017. AND… the PPS is at a whopping .0004 !!! But hey… that’s just those in the know scooping up shares because they know something BIG is about to happen, right? 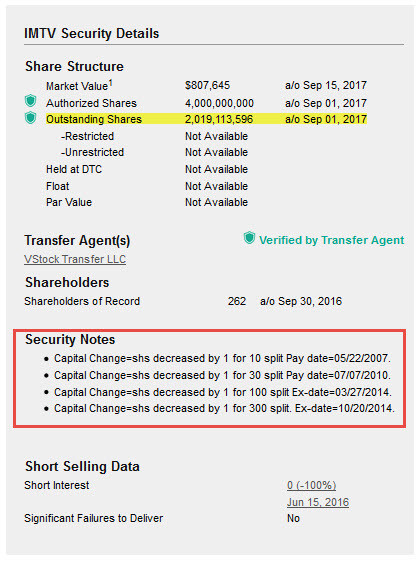 But wait… according to the OTC (see below (click to enlarge)), the Outstanding shares are only slightly over 2-billion. What’s up with that? Certainly the historical sales record as listed on the Investors Hub Website must be wrong? Um… NO, it’s not. This company has a super-duper share printing press – on steroids, cranking out the new shares to sell. Well actually, it’s likely the 60-BILLION that the debt financiers hold that are being sold. And… speaking of those 60 BILLION shares that they own… do you think it would be unthinkable of them to hire some sales people to sell those shares? What would be the best way to sell those shares? Maybe hire some people to get on the stock message boards, under fake aliases, to plant the idea into unsuspecting and novice buyers that this stock is ready to explode and you better load the boat or you will wish you had. What better way to accomplish this but to point to all the sales as evidence of this interest. Folks… its hogwash ! Anyone pumping this stock is either working for the financiers, likely under a commission basis, or, someone who was duped by the hype and now owns a ton of worthless stock and is looking for some other fool to buy it from him. Ever notice how each time the stock has a surge of sales… there is a new crop of aliases that appear? You rarely see the same names appear more than one pump. However you DO see some of the same aliases time and time again… those are the ones who have learned the valuable lesson and are trying to warn you what you are in for if you buy some IMTV stock. These folks have been involved with the company for quite some time, and they have seen… and remember, how this company operates. You might want to head their warnings. Here’s the good news… there are only 49-BILLION or so shares left to be sold ! That’s better than 60-BILLION… right ??? So… you will likely see a few more pumps to move the remaining 49-BILLION shares. Then… it’s very likely they will do a Reverse-Split to clean up the trash left over from the earlier party. It would be hard for company to promote themselves with an outstanding share count of over 60-BILLION shares. They are going to need to get that down to a respectable level so they can do it all over again. The ONLY way to do that would be to do a Reverse-Split. After all, IMTV is a pro at it, having done it 4 times in the past. They probably have the paperwork in their files and all they need to do is change the dates and amounts and put a stamp on it and let-r-go. Folks… as always… do your own homework before making a buying decision. Let Mr. Google walk you through the history of this company.